Working on a rusted bolt or screw snap in your old furniture or vehicle is certainly overly frustrating. For an average DIYer, this is a source of problems especially if they weren’t prepared. Thankfully, if you have the know-how, having a good extractor set is all you need to keep your project rolling. Of much importance is a bolt extractor. Bolt extractors provide superior connection, and gives you freedom to undo bolts when needed. 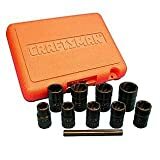 They are a quick, convenient and safe way to unscrew your bolts without causing any damage. With such importance, using the wrong type of bolt extractor can waste your valuable time, energy and may even damage your bolt head or workpiece. Whether you need a straight or spiral type of extractor will depend on your project. It is said straight bolt extractors are better when it comes to performance (Source). You’ll want to find one that works on the same size as your bolt, easy to use, versatile and budget friendly. This will make your extraction work a breeze. Since its inception over a century ago, innovation has been the hallmark of Irwin tools. This is clearly depicted from its products, the Irwin Hanson Bolt Grip Extractor not being an exception. 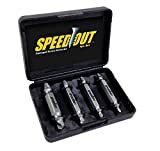 This tool comes with extracting sockets ranging from 3/8 to 5/8 inches, perhaps a perfect choice for those working on a car that has common bolt sizes. It features a spiral design that delivers the torque required for extraction projects. These spiral bits are of high-quality and allow users to strip the stubborn bolts with much ease. 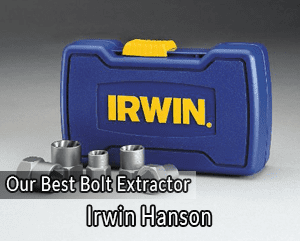 Irwin Hanson Bolt Grip Extractor is designed to handle tough screws. It extracts all the bolts regardless of whether the bolt is painted, stripped or rusted. With five common bolt extractor sizes, this is a perfect starter set and a must-have item for your toolbox, startup garage or workshop. These extractors are built to last, thanks to the durable high carbon steel construction. They also grip tightly, perhaps owing to the reverse spiral flutes that bite down to provide a maximum gripping power. Like other bolt extractors, you will need a ratchet to drive them. However, the universal design of the sockets is an assurance that it will fit all the standard sets. 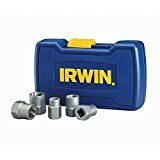 Irwin Hanson Bolt Grip Extractor’s bargain price is the main reason why this tool is a must-have for anyone working on vehicles with varying states of disrepair. If you are searching for a bolt extractor to remove tough bolts, the Craftsman Impact Grade Bolt/Nut Remover should be your choice. This tool is designed to be used alongside power tools without damaging the removers. This means that you can rip outstripped, rust-ridden or painted over bolts easily. A spiraled extractor that is fluted tapered on the socket’s interior. It bites the damaged fasteners and won’t let go. The socket grabs a greater surface area when turned counterclockwise. Can be used with an impact wrench, hand ratchet, breaker bar or air ratchet. Ideal for motorcycle, automotive, home, marine and industrial applications. The Neiko 04204A Hex Head Multi-Spline Screw and Bolt Extractor is a premium chrome molybdenum made steel extractor. It is ideal for removing broken screws, fittings, bolts, pins and threaded pipes. The tool is precisely machined with aggressive multispline teeth and left-hand spiral design that provides excellent gripping power and faster threading. The extractors’ high visibility size markings make it a quick selection for the right drill bit. 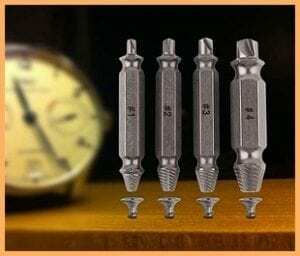 Neiko 04204A Hex Head Multi-Spline Screw and Bolt Extractor is specially designed with hexagon head that provides maximum torque when used with sockets and wrenches. ABN – Auto Body Now is a well-known ever-expanding tool brand that aims at covering a wide variety of important auto tools. Tools from ABN are tried and tested and available for use with various auto body projects. 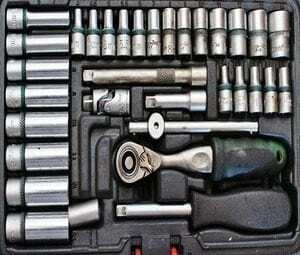 The company provides tools and supplies ranging from specialty tools and accessories for general maintenance and upkeep. The ABN Spiral Screw and Bolt Extractor, one of their latest product on the market, is slowly becoming the best choice of bolt extractor for DIYers. Perhaps this product’s feature highlight is the fluted design that gives the extractor excellent power to withstand resistance. This tool set comes with a left-hand spiral design that offers increased riveting power. With this reverting broken studs, screws, fittings, bolts, and pins will be a breeze. The set is designed with premium quality cobalt and alloy that ascertains maximum durability. The ABN Spiral Screw and Bolt Extractor’s drill bits are marked according to their sizes. They are also well-organized in its accompanying blow-molded case on good order. The set is handy, strong and durable enough to provide outstanding extraction process. If you are in the market for a bolt extractor to remove the stubborn bolts and screws within seconds, the Ontel SpeedOut Damaged Screw and Bolt Extractor should be your product of choice. This tool is made with high-quality premium quality steel to provide an assurance of withstanding high torsion. You will love the fact that this tool is compatible with any drill type. 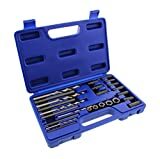 Therefore, when using this toolset, you won’t have to worry about the size of your screws and bolts. The extractor gets the job done regardless of the size of bolts and screws. The other intriguing feature of the Ontel SpeedOut Damaged Screw and Bolt Extractor is its ability to remove screws and bolts on wood or machine. This makes it a perfect choice for contractors, DIYers, carpenters, and handymen. As mentioned before, buying a poor quality bolt extractor is a pure waste of your time, energy and money. Using a quality tool is a great way of achieving better results, and bolt extractors are no exception. If you don’t know, bolt extractors are designed to remove specific types of screws. Therefore, a wrong choice of the extractor can be costly. To avoid this, consider the following critical factors when shopping for a bolt extractor. This type allows the user to remove mildly stripped and heavily rusted bolts. They are overly convenient since they fit into air tools, breaker bar or ratchet without requiring any modifications. Socket extractors tend to destroy the head of the bolt. However, frankly, the most important thing is to remove the stubborn bolts as they can be replaced later. Using them is quite easy. You just need to stick the socket extractor on the bolt and turn the ratchet or pneumatic tool to grip down the bolt. These are destructive bolt extractors but have high chances of success when used to remove a bolt. This type removes even the tiniest bolt with a small head left on it. You will need to drill the bolt and make sure that everything is sized correctly to use it. Bolt extractors come in specific sizes. Whereas some extractors can handle any type or size of the bolt, others work with specific sizes. Therefore, knowing the size of your bolt before buying can help you determine the right size. Generally, an extractor that can handle any type or size of the screw is handy as you can use it in future projects without necessarily purchasing another tool. The material used in construction directly determines the quality of a bolt extractor. Most modern extractors are made from hardened steel and titanium metal. These are strong and durable metals, which provide an assurance of using the tool for quite a long time. Other features of meta quality include rustproof and corrosion resistance that adds to the effectiveness and durable stunt of the tool. Having an extractor with such features allows you to enjoy several years of stress-free extraction. You certainly understand the stress that comes with working with a heavy tool. Similarly, a heavy bolt extractor will drain your energy, especially when working on demanding projects. You will also not enjoy the ease and comfort of using the tool. Therefore, focus on purchasing a light tool that can be handled with ease without being overwhelmed with its weight. Besides, ensure that it features an ergonomic handle that helps in providing a secure grip. This minimizes your fatigue levels after working. Nobody wants to stick on removing one bolt for several hours. The gripping power of a bolt extractor determines how long it will take to get your bolt out. A good bolt extractor should be designed in a way that it increases gripping power with increased resistance. Consider reading customer reviews to determine the general performance of the bolt extractor. Tools are made to make your work easy. This is exactly what your bolt extractor should do. Modern removers come with matched drill bits on the case. This allows you to match your bits easily to the preferred extractor diameter to make the process simple. Bolt extractors that haven’t been organized increases confusion and wastes much of your valuable time. Technology certainly comes with a lot of challenges. Some of the tools may not function as expected. 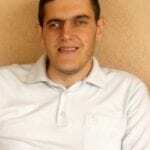 Therefore, it is of much importance to have a guarantee. In cases of failure occur, you can be sure of immediate compensation. Avoid going for the destructive method before working on a bolt. There are several things you can do to make your work easier, including the use of a bolt extractor. Bolt extractors are must-have tools that professionals have relied on for years to remove stubborn and damaged screws easily without causing damage to the workpiece. When using the bolt extractor, you should begin by preparing the bolt. Preparation basically involves placing the center punch in the head and gently tapping the divot for the extractor to follow. You should also apply some thread cutting oil to the bolt for lubrication. The surge in bolt extractor brands on the market has made it difficult to find the best tool. This can be challenging, bit having some grasp of our best products above and understanding what makes a good extractor comes in handy. This will help you find the right product that suits your needs. From our list of best bolt extractors above, which one do you think is your favorite? Share with us in the comments section below!